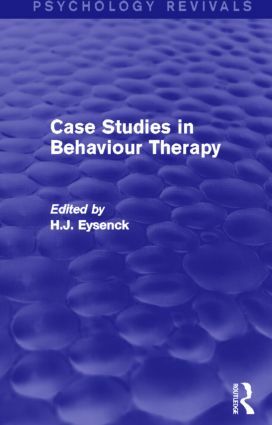 Originally published in 1976 and on the basis of extended case histories, Eysenck showed how experts dealt with problems which arose in the course of behaviour therapy. It showed how they formulated hypotheses about causation and treatment, and used these to structure the methods employed; and how they changed their hypotheses when treatment showed them to have been mistaken. The prime aim was to demonstrate the complexities involved in even apparently simple cases, and the need to base treatment on a proper understanding of the dynamics of the case. All the articles were specially written for this book, the purpose being to underline the need to state the dynamics of a case in such a form that they could be used as hypotheses leading to specific treatment recommendations. The hypotheses were tested by the success or failure of the treatment, thus making the treatment of individual patients a proper experimental procedure. Behaviour therapy emphasises the fundamental importance of the outcome problem and only experience can teach the behaviour therapist just how this interplay of theory formulation and design of location, evaluation of effect and changes in theory, works in actual practice. The book will help those engaged in this type of therapy to understand the process better, and to gain a quicker mastery of the technique. Can (Alcoholic) Case Studies Demonstrate General (Behavioral) Principles?